It’s heavy, it’s annoying, and it’s unwanted. Whether it’s a sick child, a fussy baby, or a load of pukey laundry, it’s a cross. It might be a chronic pain or illness, the suffering of a loved one, or a situation you have to endure. Whatever your cross is—the constant cross and the current cross—it’s not easy to carry. As Jesus stumbled with his cross, there was a chorus of scorn coming from the sidelines, mingled with the howls of mourning women. Sweat was running down his body, sting- ing the freshly opened cuts. With each step he took, he was closer to the glory that would come through the cross. No one else saw it—though Mary must have seen it—as God’s will. She said yes as she stood there, mute in the face of the horror. She accepted God’s will, even as she wondered why and how. We each carry our own cross, but we are not alone. Your cross might be inside you, but you are not alone. Whether or not you have a network of family and friends, you have a heavenly Father and a host of saints who are praying for you. 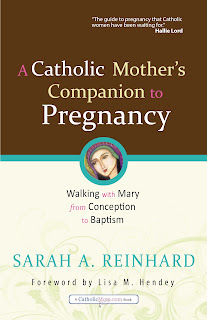 “A Catholic Mother’s Companion to Pregnancy: Walking with Mary from Conception to Baptism” is the book I wish I had owned and read when I was going through my own pregnancies. Sarah Reinhard, a self-described “non-baby” person – even though she has three lovely children of her own, takes an honest and faith-filled look at pregnancy. 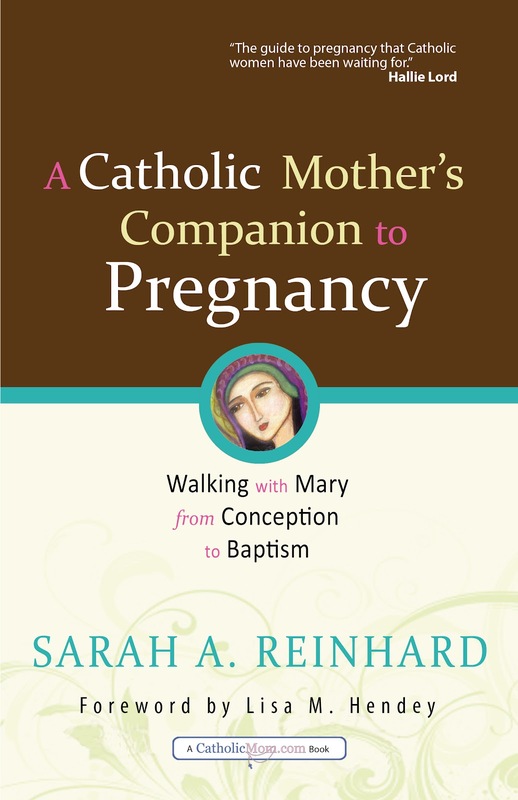 If you are Catholic and pregnant, or know someone who is, “A Catholic Mother’s Companion to Pregnancy” is definitely a book you want to buy!